I’ve seen this blog post title before, and I’m now jumping on the bandwagon to acknowledge the odd paths and sources I visit when tracking good ideas. 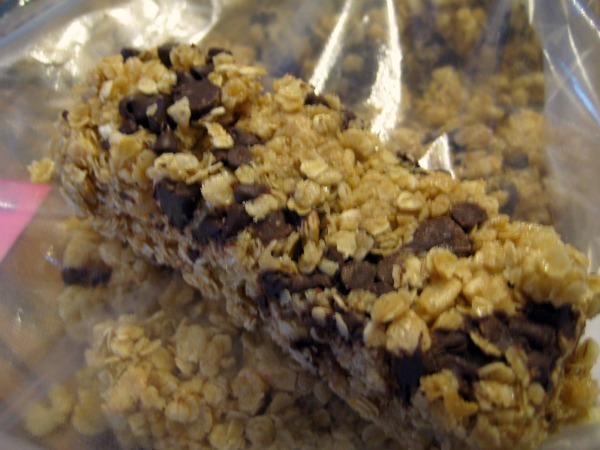 The pin was No-Bake Chocolate Chip Granola Bars, which someone pinned from Lauren’s original post. With someone recommending the elimination of soy products, my older son saw that granola bars contain soybean oil. Good time to start on this recipe, eh? Result: My youngest says that they are so good that they don’t need chocolate. And the girl really loves chocolate. Recipe Preface: Since you may have seen me talk about Healthy Snacks to Go (affiliate link), first let me say that this recipe is much cheaper to make than Katie’s. Sucanat compared to brown sugar has its merit and I get the arguments, and Katie talks about substituting brown sugar. I also understand nuts vs. crispy rice cereal. Same story from me. I get it. Rice Krispies are cheap and processed and toxic. Let’s move on. Recipe Review: This recipe is very easy because all the ingredients are usually in your pantry and not expensive. Except for the honey, but I have a backyard hive, so this is not an issue for me. I would add the following to the recipe: You will be aiming for the soft ball stage before mixing the honey with the oats and rice. I would like to try this recipe with Katie’s crisping method and will report back here if I get a chance. Let’s be honest — if I stop being lazy and take the time to do it. The bars are very good as is. — update — THE CRISPING YIELDS AN EXCELLENT BAR. Test for the Soft ball stage: Courtesy of my Aunt Willie, who showed me this at her place when I was 14 years old. Get a cup of cold water and keep it near your candy. In this case, the sugar/honey/butter mixture. The recipe calls for a two minute boil. Let’s get precise — dip a spoon in the candy, get a drip of it in the cold water. If the candy masses and balls up and you can push it around, it’s ready. If the candy dissolves, doesn’t mass up, you can’t see anything, boil it longer. Re-drip after another thirty seconds. If the candy is hard once it hits the water, start over because it’s cooked too long. 1 Response to I made no-bake granola bars | Pin it! Do it! Thanks for stopping by Corner of Main, and thanks for your sweet comment!